AER Memories of Old is a game of two halves. One, clearly inspired by Zelda, is about dungeons, puzzles and platforming. It’s fine, but it’s the other half—where the player is able to transform into a bird and fly around a massive map—that I want to talk about. I’ve had my eye on the game for a few years now, mostly because of I was in love with that flight. 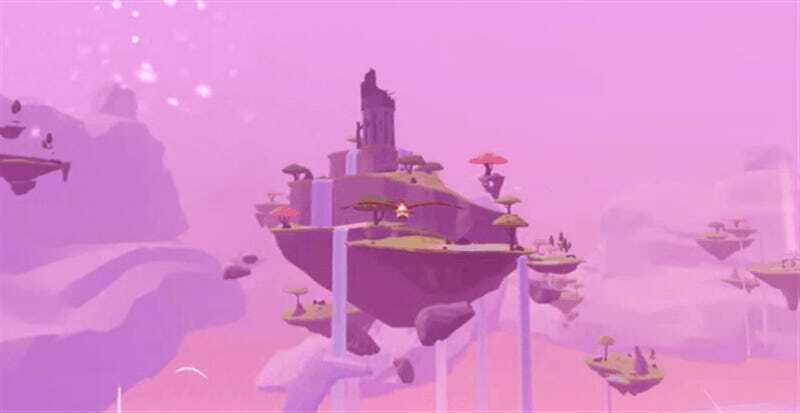 A sense of swift open world travel is one of my absolute favourite things in a video game, from Wind Waker to The Witcher 3, so when I saw a big part of AER would consist of soaring through the clouds as you flew from island to island, I was on the hook. The best way to describe it is this: imagine if Breath of the Wild’s glider could be activated at any point, instead of just going downhill. And instead of gliding, it could fly anywhere, because you were now literally a bird, and not just a guy holding a big kite. It is pure joy. For all the other things this game does well, from its art style to its minimal presentation, I wish the entire game was just flying around. 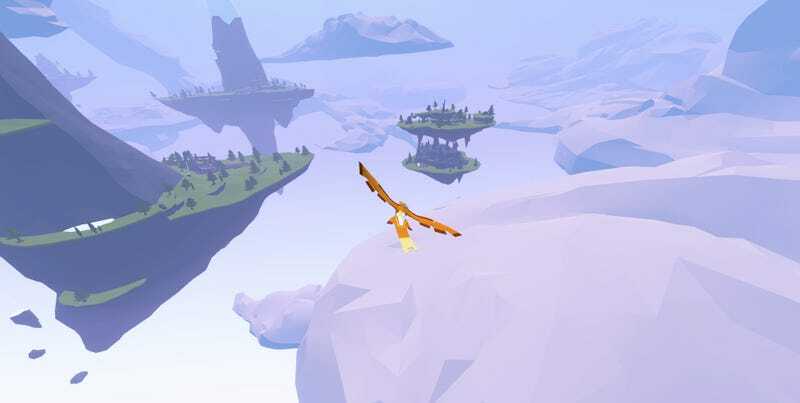 All you need to do is jump in the air, press a button while you’re off the ground and whoosh, you transform into an eagle and shoot into the sky. The fun is in how the whole flight system moves, and looks. There’s an elegance and refinement to AER’s flight that I don’t think I’ve enjoyed more in any other game about this kind of flight, not even Far Cry, not even the very recent Superflight. Every move is carried out so smoothly, and with such precision, that it can be nice to just hang in the air, adjusting your movements ever so slightly, enjoying the sensation. Or you can hit the throttle and pull of stunt moves through narrow rock crevices and cave openings, the eagle responding perfectly to every tiny nudge of the thumbstick. It feels a little weird to just keep talking about the game’s flight, since in the grand scheme of things it doesn’t actually constitute that great a percentage of the overall experience. Most of your time in AER will be spent in Zelda-like dungeons, twisting dials and running around trying to remember where you’d already been, and like I said that stuff works, even if it’s also riddled with frustrations. The game’s minimal user interface looks great on the overworld, as you wander through towns and fly over waterfalls, but once you hit a dungeon you’re left wanting for maps, compasses, signposts and hints. And without combat (dungeons only consist of exploration and puzzles), things get a bit repetitive as well. It’s a disappointing contrast to the breezy freedom of the overworld to find yourself lost and grounded so often in the on-foot sections, though personally I guess they also served as motivation to get back out there flying, and as a reference point to remind me how good those sections really were. But hey, even given the slog of the slower sections, I still think AER is worth a look just to experience its freedom and flight. It’s out now, and is available on PC, Xbox One and PS4.